1. You may have called during a rebroadcast - at this time there is no one in the studio (the magic of technology) . 2. The on-air person is not authorized to get messages from the machine - this is to keep from accidentally deleting other messages. We are working on better ways to connect with listeners because we WANT to hear from you. 1. If you are calling into a show, wait until about 30 seconds after a song starts. Before this the DJ might still have headphones on and will be busy setting up the next song. Please don't call while we are speaking on the air, the mic will pick up the ringing. 2. If you don't get an answer, hang up and try in about 5 minutes. Sometimes we have to answer nature's call. 3. If that fails, then leave a message and mention the show and the date (like "Hi, I am calling Nashville Skyline on the 24th with a request" . You don't need to leave a return phone number for most calls unless you have a specific reason for someone to get back to you. 4. Send an e-mail to WAPJFM@SBCGlobal.net We will try to forward this to the right person. Because of staffing, sometimes calls don't get answered in a timely manner. Don't get discouraged, keep trying. Update - It looks like we are back up at full volume with no hum - Thanks for your patience! A bad AT&T program circuit between our studio and the 89.9 FM transmitter located on Highland Avenue in Torrington has resulted in a constant hum on that frequency. We've had a number of calls from listeners alerting us to this problem. Thank you for the input. Our station engineer informs us that AT&T is aware of and addressing this issue, which will hopefully be resolved within a day or two. In the meantime, if you're able, tune in to the 105.1 signal. We apologize for this inconvenience and look forward to once again providing you with quality local programming on both frequencies as soon as possible. 6- Armor Of God / Asherman Meets Dub Street Rockers / Zion Ready / JumpUp! 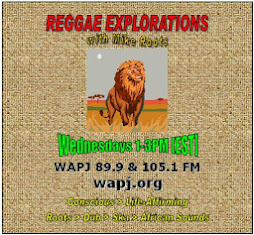 9- Roots / The Israelites / Roots / JumpUp! 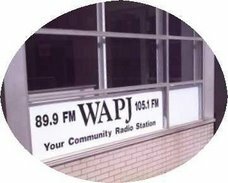 At WAPJ, we value the opinions, suggestions and comments from YOU- our listeners. WAPJ exists not to serve ourselves, but to serve the community. What are we doing good? What could we do better? What would you like to hear in the future? We would love to hear from you either by e-mail at wapjfm@sbcglobal.net or by calling us at (860)489-9033. We'll do our best to respond as soon as possible. Thanks! 9- Blood Brothers / Garth Hewitt & Ben Okafor / Blood Brothers / What?